Over 100 billion bulkmail messages are sent every day. You may know them as spam, junk mail, unsolicited email. Whatever you call them, they’re annoying. At the least, they clutter your inbox and present the risk of you missing important emails from family, friends and coworkers. At the worst, they put your computer at risk for viruses and make you susceptible to identity theft and costly or time-consuming processes to keep yourself and your contacts safe. Nobody has provided a safe, easy, and inexpensive method for eradicating these annoyances from our lives. Until now. Unlike most bulkmail-prevention services, we don’t rely on computers to guess if an email is spam, blocking false positives and delivering messages from crafty bulkmailers. We don’t rely on outdated lists or scour the content of your message. 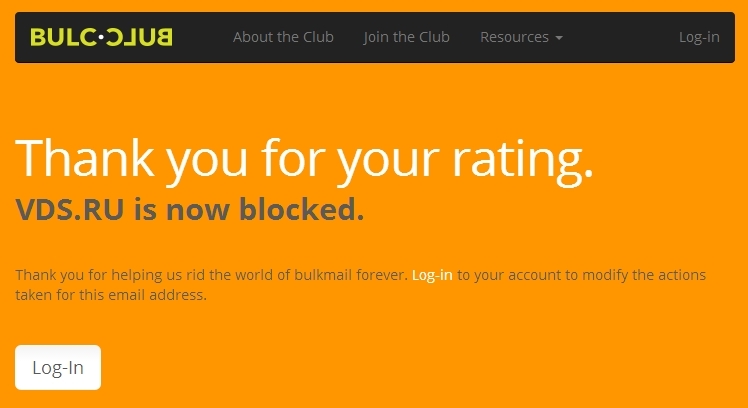 Instead, Bulc Club relies on Forwarders and Club Ratings for a much safer and more effective method of eradicating bulkmail from your inbox. Curious? Give us a few minutes to show you how Bulc Club works. Sometimes you can opt-out of receiving messages from the bank or business where you subscribed. You’ll see a message that informs you that it could take 3-6 weeks for you to stop receiving emails. In this time (and before), they’re busy selling your address to anyone they can. Other times, the “unsubscribe” link at the bottom of emails will unsubscribe you from that newsletter while simultaneously subscribing you to a dozen more. And still other times, the unsubscribe link is missing, broken, or ineffective at getting your address off any lists. The absolute foolproof way is to never give them your email address at all. Bulc Club doesn’t replace your email address, we simply protect it from the outside world. You’ll still use your email address the way you normally do to contact friends and family, but you’ll no longer use it to subscribe to newsletters, contests, or services online. Instead, Bulc Club automatically creates email addresses that forward mail to your private email address (or “forwarders”). Every Bulc Club member is entitled to unlimited forwarders. This way, when the bank or mortgager or subscription service decide to sell your information, they’re only selling one of our forwarders, not your personal email address. If you give Big Bank & Trust a Bulc Club forwarder (say: bigbankandtrust@smith.bulc.club) and they sell that forwarder, simply block the forwarder and you’ll never receive any messages that come through it. Your email address is safe and your inbox is empty! All Bulc Club forwarders are created automatically. Imagine you’re standing in the check-out lane at your local gas station, Guzzle-n-Go, and a clerk asks if you want to enroll into a contest to win free gas. Do you have time to log-in to your Bulc Club Console and create the forwarder? Of course not. Simply make one up on-the-spot (“guzzlengo@smith.bulc.club”) and Bulc Club will apply it to your account the first time it’s used. If you receive email to this forwarder by companies other than your gas station, you know exactly who sold your address. Mark the messages that don’t pertain to the contest as bulkmail and not only will these messages not make it to your inbox, but you’ll also help our other members who have been receiving bulkmail from these senders. If enough of our members mark the messages as bulkmail to increase the Club Rating to 50%+, the only messages that will be forwarded to your inbox will be valid emails pertaining to the contest. All other messages from soliciters that bought your email address will be filtered without you ever seeing them! When the contest is over, simply click the option by the forwarder to deny all messages. Anything sent to that forwarder won’t be delivered to your inbox. Traditionally, if you receive a bulkmail message, you drag it to your junk folder. This may or may not inform your mail client to block all messages from this email address. But bulkmailers are craftier than that. Oftentimes you’ll receive the same message from different email addresses day after day. This is called “spoofing.” It means that the email address in the “to” field isn’t the originator of the email. Typically, the original sender’s information is hidden somewhere in the message headers. Every message sent through a Bulc Club forwarder is parsed and dissected to locate the original sender’s email address, domain name, and IP address. Unlike other spam-prevention services, we never read the body or content of the email. Once we know this information about the original sender, we match it against records in our database to check the likelihood of the sender being a bulkmailer. The records come from other Bulc Club members, and the ratings for each are based on these members marking messages as bulkmail. This is what we call a Club Rating. If the Club Rating for an original sender’s email address is greater than 50%, the email doesn’t get forwarded to you. If the Club Rating for an original sender’s domain is greater than 50%, no emails from that domain are forwarded to your inbox. Instead, they sit in your Bulc Club Console for thirty days. You have the choice to log-in once a month and decide if you want the messages delivered, or let them be deleted when the 30 days are over. Each time you receive a message through one of our forwarders, we add two links to the top of the email along with the sender’s original – not spoofed – email address and domain. In case a bulkmail slips through, easily click “Block Email Address” to never receive a message from the bulkmailer’s original email address again. If you believe the whole domain should be blocked instead, simply click “Block Domain” and you’ll never receive a message from the bulkmailer’s original mail server domain again. Clicking these links in your email, as well as changing the actions in your Bulc Club console for each email address will adjust the Club Rating. This not only prevents you from receiving messages from these senders, but also every other member of Bulc Club. Before, you dragged the message to your junk mail folder. With Bulc Club, it’s the same as dragging the message to every member’s junk mail folder before it even lands in their inboxes! And with each member evaluating email addresses and domains and increasing their Club Ratings, they’re keeping your inbox clean from bulkmail too! With our growing list of club members, we believe we can rid the world of bulkmail forever. But we need your help to do it. The more members, the stronger the Club Ratings. The stronger the ratings, the less bulkmail slips through to our inboxes. Everybody wins. We’re so confident you’re gonna love being a member of Bulc Club, we’ll give you a few free months. Visit Bulc.Club to learn more about membership plans and details on member benefits. Are you tired of receiving bulkmail? Join the Club!